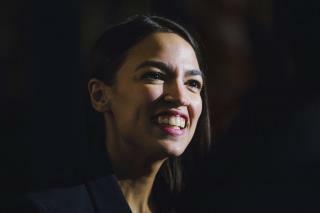 (Newser) – Rep. Alexandria Ocasio-Cortez fired back at Ivanka Trump on Tuesday after the president's daughter criticized the jobs guarantee in the Green New Deal and spoke to Fox News about "what workers want." The Democrat didn't mention Ivanka Trump by name in her rebuke but it was clear that she was contrasting their experiences, the Guardian reports. "As a person who actually worked for tips & hourly wages in my life, instead of having to learn about it 2nd-hand, I can tell you that most people want to be paid enough to live," she tweeted. "A living wage isn’t a gift, it’s a right. Workers are often paid far less than the value they create." Airhead AOC failed to comprehend what was being said. The Green New Deal is imposing excessive expenses on everyone. As the wages get pusher higher, so do the priced of everything. There has never been a socialist system that has been successful. But that won't stop AOC and the liberal from trying to destroy America. Back and forth political banter from elected officials with the general populace on social media sites should not be permitted. They set themselves up as potential targets of negative comments and personal attacks.